Taken at random off the net, this unfortunate shot is the image we really do not want to see. Bearing in mind that a photo is a second out of the sequence and a trainer is ( hopefuly) very nearby to difuse this situation, it is perhaps a warning of the image badly selected photos can present. Explosions of lively action are photogenic, but I hope they are not typical of a normal Instinct Test or training session! Calm. Control. Consideration. Common sense!!! Yes! Human nature makes us both aquistitive and competitive. All breeds herding in the U.K has no official recognition, no awards, no grades,points cups or certificates. Yet. 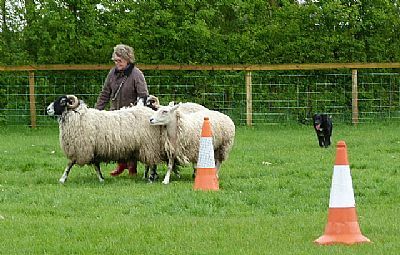 But, hey, it's important to realise we actually train dogs to help us manage sheep (or whatever we work with) Stress reduced animal handling with canine/human team work is Glebe Farm's main goal. Click the link to see some sheep training explained! You can’t train a sheepdog without sheep! 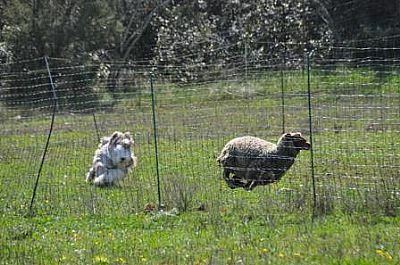 You can't train a sheepdog without SHEEPSENSE! Once your training reaches the independent stage you will be given access to sheep by yourself. That means you are responsible for the sheep while you use them. You will need to observe the condition of the sheep, and adjust your training if they begin to pant. There may be no need to leave the field before you are ready, but keeping the dog stopped at a distance for a minute or two at intervals is good training and good practice. The sheep you will be working on are schoolmasters, for every one who comes, and are not infinite. Lamed, wounded or stunned, they cease to be available for others to work. Abuse is not part of the deal. Dogs and owners who cannot accept or enforce necessary correction will be denied access to sheep. They must be PREVENTED from continuing to do so, BY YOU. However keen the owner is, if their dog cannot accept control, (Sulking, cringingly persisting, refusing to work unless given in to, are as destructive as outright defiance to the partnership!) it will never be a sheepdog. Once training starts, be aware of your dog’s increased interest in stock when out walking!